A flipper is a common term for a partial denture designed to replace one or a few teeth. This term evolved because it can easily be “flipped out” by the action of the tongue. 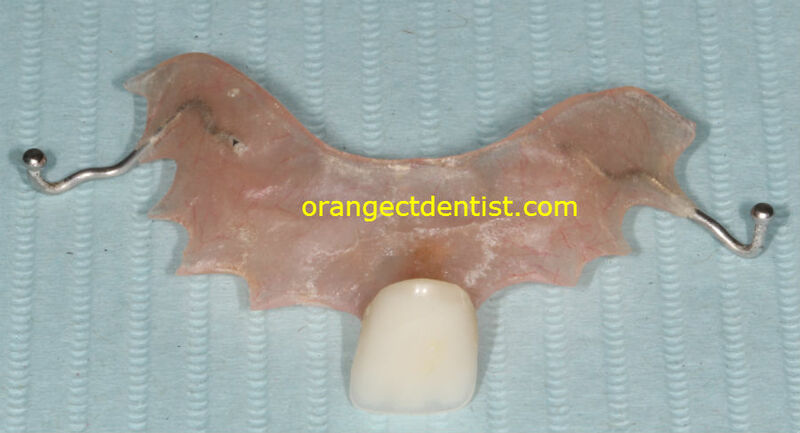 Single Tooth Flipper made to replace a missing front tooth. He wore this while he was waiting for a dental implant. A flipper is really just a special kind of denture. It typically replaces only a single tooth – usually a front one. It is removable and it is not cemented into place. Depending upon the shape of your teeth and the contours of the roof of your mouth, special metal clasps may be required. This is visible on the photograph to the left. On the photograph below, you will see another flipper for which metal clasps were not required. Most of the time, patients do not have to wear denture adhesive with these. But in some cases, the adhesive will be needed. Another flipper and the model from which it was made. This flipper did not require metal clasps. In general, a flipper is not designed for long term use. The thin acrylic cannot handle chewing forces for years the way other denture materials can. Most patients wear these prostheses while they are waiting for either a bridge or an implant. In many cases, a damaged tooth is removed, an implant is placed, and we insert the flipper that same day. 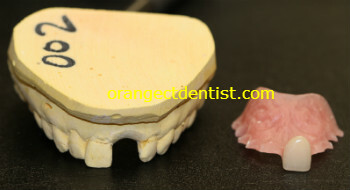 You then wear the flipper for the 4 months or so it requires for the implant to be ready to hold a crown. We routinely fabricate these in our office for patients.